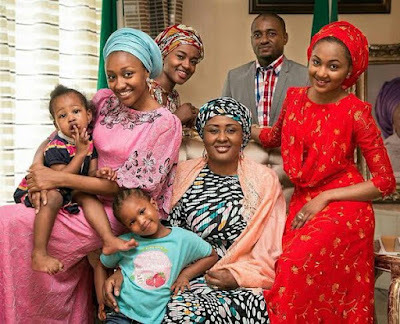 Aisha Buhari, wife of President Muhammadu Buhari has said she feeds her children with her personal money. And that the State House, Abuja caters for her welfare only when it was necessary. According to Aisha, she had not been accorded the official privileges given to her predecessors as the Fist Lady of the country. Mrs. Buhari therefore challenged the online reporters to show evidence of their report to disproof her claims. “The attention of the Wife of the President, Hajia Aisha Buhari has been drawn to a report in Sahara Reporters where, she was amongst other things accused of abuse of privileges at Nigerian High Commission in London. “It is not in her interest to join issues with anyone or defend others mentioned in the report, it is however paramount to put the record in proper perspectives as it concerns her trips to UK vis-à-vis the Nigerian High Commission in London. “Aisha Buhari has never traveled to London with a large entourage as was carried in the report. The highest number of people on a trip involves her three kids, ADC, and her personal physician. “The Nigerian Commission in London has never offered any favor either monetarily or materially to her or her so called entourage on any of her trips to London. “The state house in Abuja caters for her meal when necessary, and other healthy food or variety needed by her children are her personal responsibility. “It is on record that the Nigerian Commission in London does not receive Aisha Buhari at the airport with any official distinction or privileges as was accorded other first ladies before her. “Her drivers are privately arranged without any recourse to the embassy for staff. “She has never complained or raised dust about any of these acts by the High Commission because of the understanding, as clearly spelt out and practiced by her husband, that public office must be separated from the private lives of the occupants. “She has always been an advocate of good governance where officials of government are responsive and appealing to their constituents, it therefore baffles the imagination that one could believe she would corroborate with any government official however highly placed either at home or abroad to shortchange the Nigerian people. “These records are not hidden for a non-mischievous reporter who really intends to inform the people and not to disparage the family of the President just to add weight to a report. “Aisha Buhari would have ignored this, like all of such baseless accusations, but the angle to which the report was presented has a corruption and abuse of privileges connotation which negates the fundamental principle upon which this administration thrives. “Consequently, Sahara reporter or any of the embassy staff is hereby challenged to provide any concrete evidence either in hard or soft copy to contradict Aisha’s Buhari’s position as it concerns her trips to London. I simply desired to say thanks yet again. I’m not certain the things I would have achieved in the absence of the ways shown by you relating to such subject. It was a real scary issue in my position, however , witnessing the very skilled mode you managed that took me to weep for fulfillment. Now i’m happier for this information and in addition expect you are aware of an amazing job you are always providing educating many people by way of your web page. I’m certain you haven’t met any of us. cyezyqp,This website truly has alll of the information and facts I wanted about this subject and didn?t know who to ask. I would like to express some thanks to you just for rescuing me from such a setting. Right after looking throughout the search engines and seeing techniques which were not pleasant, I figured my entire life was over. Existing devoid of the solutions to the issues you’ve resolved through this article content is a critical case, and the kind that could have badly affected my entire career if I had not come across your blog post. Your own personal talents and kindness in controlling a lot of things was tremendous. I’m not sure what I would’ve done if I hadn’t come upon such a step like this. I can also at this time relish my future. Thank you very much for this reliable and sensible help. I will not hesitate to recommend the website to anybody who ought to have care about this area.